Renowned sushi master James Holder has opened his latest restaurant venture, James’ Place, adjacent to one of San Diego’s cultural epicenters, La Jolla Playhouse. The opening comes amid high anticipation from theater patrons, the UC San Diego community, La Jolla locals and San Diegans across San Diego county who have experienced a void since Wolfgang Puck’s Jai closed its doors nearly 18 months ago. The new 3,900 square foot space boasts a sleek, minimalist design intended to seamlessly complement Holder’s Asian inspired menu offerings. A native of Japan, Holder began honing his craft at 13 years old when he embarked on the art of sushi making in his hometown of Hiyama. Since that time Holder has finessed his skills in notable San Diego kitchens including Café Japengo, where he was instrumental in the restaurant’s opening. During his tenure there, the restaurant was awarded the California Restaurant Association’s Gold Medallion Award for “Best Sushi” for eight consecutive years as well as San Diego Magazine’s “Best Sushi” designation for seven years in a row. In addition to his work with James’ Place, Holder also serves as Chef/Partner at Mitch’s on El Paseo, located in the heart of Palm Desert. At James’ Place, Holder has sourced the finest and freshest ingredients to create a seafood-centric menu of innovative dishes with highlights including Hibachi Hokkaido Scallop with grilled Northern Japanese scallops, lemon crème sauce, chukka salad and habañero tobiko, Truffle Tuna Tartare with diced tuna, cucumber, avocado, diced mango, truffle oil and ponzu sauce and Braised Short Ribs with Hawaiian-style soy marinated short ribs, sautéed shitake mushrooms, baby heirloom tomato, sugar peas and pineapple fried rice. In addition to a broad selection of lighter fare, the menu is also largely dedicated to multiple rice and noodle options that include Tempura Soba with soy broth, buckwheat noodles, seaweed, green onion with shrimp and tempura vegetables and Tonkotsu Ramen with pork broth, Japanese noodles, sliced char siu pork, bamboo chute, seaweed, seasoned egg, stir fried vegetables and red ginger. A flavor-forward sushi menu rounds out the restaurant’s abundance of offerings with 22 artfully handcrafted rolls including the Alejandro with snow crab, spicy tuna and cream cheese topped with sliced avocado, habanera tobiko eggs and kabayaki sauce and the Surf & Turf with grilled lobster, snow crab, avocado, cucumber and asparagus topped with sliced Kobe beef, garlic chips and ponzu sauce. Holder’s eclectic menu is accompanied by a curated selection of wines by the glass and bottle, a dozen sake options and a signature cocktail list with highlights including the Lychee Elderflower Martini with vodka, blue lychee liquor and St. Germain. There is ample choice from the Asian inspired menu for guests to enjoy either from one of 32 seats surrounding the sleek, illuminated quartzite bar or throughout the sophisticated restaurant set off by floor to ceiling windows and an abundance of hanging orb lanterns. Outdoor seating is also available, allowing patrons to enjoy the campus’ serene, well-landscaped setting and the city’s enviable weather year-round. 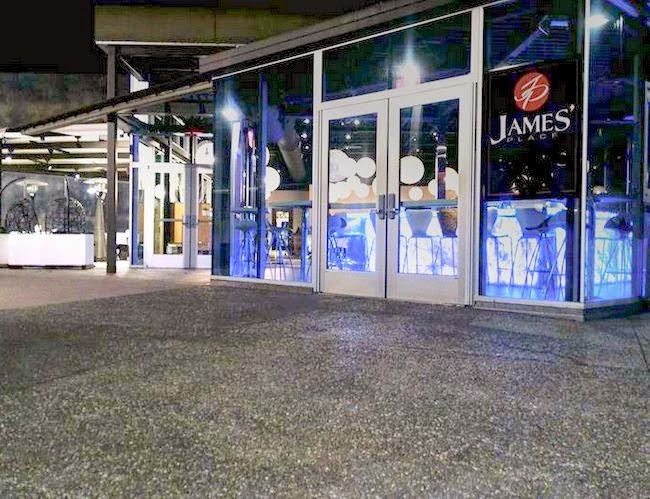 With multiple price points including a special menu geared towards the UC San Diego student population, James’ Place intends to garner a diverse cross-section of diners. As an added incentive for students, the restaurant accepts Triton Cash, the campus’ convenient, pre-loaded cash card. Catering to all guests including students as well as UC San Diego and La Jolla Playhouse staff, the restaurant opens with a daily happy hour that begins at 3:00 p.m. on weekdays and 1:00 p.m. on weekends and runs until 6:30 p.m. with highlights including $5 and $6 sushi rolls in addition to beer, cocktail and sake specials. James’ Place is open from 3pm to close Monday through Friday and from 1pm to close on Saturday and Sunday. The restaurant is located at 2910 La Jolla Village Drive, next to La Jolla Playhouse. Self-parking is available during all restaurant hours, with complimentary valet provided during all La Jolla Playhouse performance dates and times listed on the website at lajollaplayhouse.org/the-season. For more information, visit jamesplacelajolla.com.